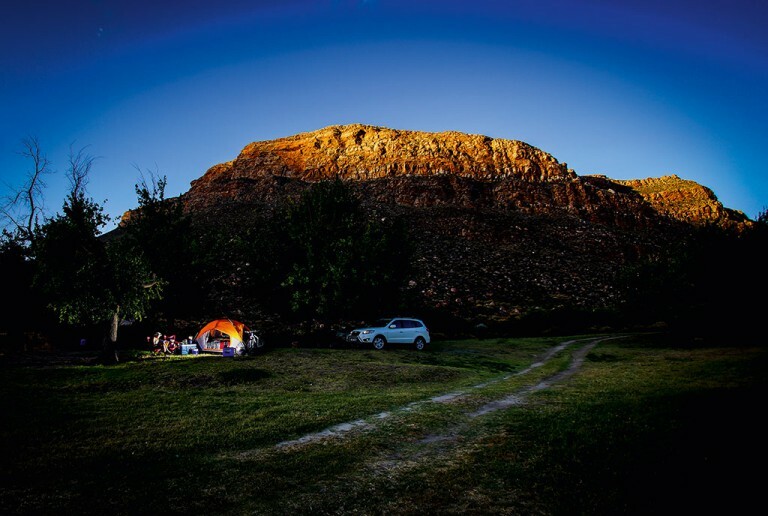 Somewhere within the rugged wilderness that embraces the Cederberg ranges – and probably at the very end of a juddery gravel road – is your ultimate Cederberg campsite. 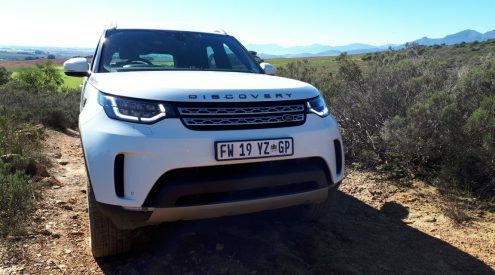 Jacques Marais takes a backroad to find them. 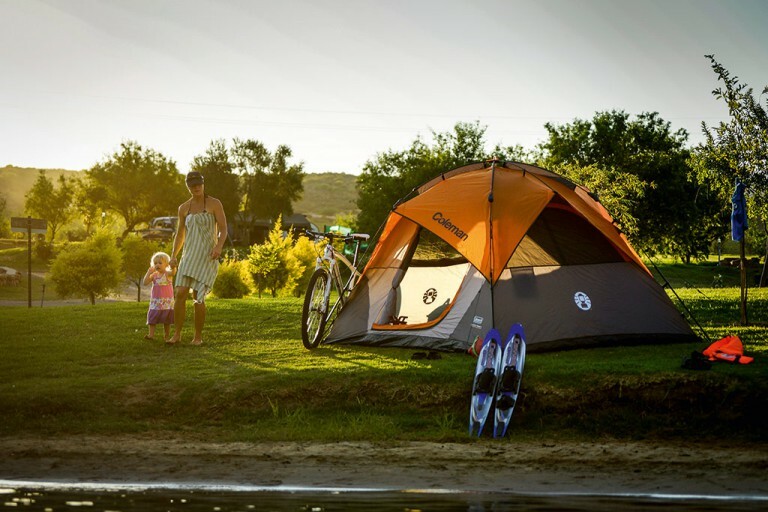 Rondeberg Resort has camping right on the edge of the Bulshoek Dam, which is popular for watersports. The Cederberg Wilderness Area is proper. At about 710 square kilometres, it is a truly vast landscape bristling with serrated sandstone cliffs, tumbling scree slopes and deep valleys. Not many people live in this remote region and, as such, it remains a largely unexplored space. This may be one of the reasons why the Cape outdoor crowd visits this extraterrestrial land so often. One can wander contentedly – away from the crush of traffic and the bustle of business – while gawking at a horizon spiked by dramatic peaks rearing up to clash against the blue bowl of sky. Over the millennia, elemental forces and extreme temperatures have forged a land of absolutes, and back-road explorers are sure to be blown away by the grandeur of this rugged region. Did I hear anyone shout ‘road trip’ just then? Gnarly gravel roads, winding mountain passes, dry-gulch river crossings which may flood at the first sniff of a thunderstorm… even though the Cederberg area is accessible in many places with a sedan, it makes more sense to face off against terra firma in a good-quality SUV at the very least, and preferably in a 4×4 vehicle. So, trip on to the N7, crank up some music and head north through the cuttings of Piekenierskloof towards Citrusdal. Between here and Vanrhynsdorp, you will start noticing a bunch of dirt roads slip-sliding to your right. Along these bumpy routes, you will discover hidden oases, some of the highest vineyards in the country, San rock paintings, historic mission villages where leather veldskoene are still made by hand, snow protea and other rare fynbos species, endangered Cape mountain leopard, and a thousand travel secrets mere mortals will never get to experience. And the best way to do this, you may ask? Pitch a tent! Spectacular camping sites dot the Cederberg ranges, and we’ve highlighted a selection to cover as broad a range of options as possible. From mild to wild, from really remote to relatively accessible, upmarket to affordable… and now, all you have to do is pitch up. Directions: Your best route is via Ceres, from where you follow the R303 to Op Die Berg (30 kilometres from Ceres) and turn right at the Kagga Kamma sign on a good gravel road up Katbakkies Pass, looking out for a signboard to your left. You will reach the entrance after 15 kilometres and reception after a further four kilometres. Cost: Main lodge camping from R60 per person and R180 per vehicle; wild camping from R45 per person and R180 per vehicle (no electrical hook-ups). The San rock art at Kagga Kamma is exceptional and extremely well-preserved. Kagga Kamma falls within the Swartruggens conservancy and forms an enthralling ecological biome bridging the Cederberg and Ceres-Karoo. In essence, the mix of karroid and arid fynbos vegetation make for a breathtaking nature experience, on fynbos plains abutting the southern tip of the Cederberg ranges. The 15000-hectare reserve is a premium establishment (part of the RCI Group) and primarily caters to a combination of well-heeled local and international travellers. One of its best-kept secrets, however, is its spectacular campsites. These superb getaway spots (including true wilderness camping along the 4×4 route) make this spectacular reserve accessible to a much wider range of tourists. The main camping area – less than a kilometre from the lodge, and with sites set in a semi-circle around a natural rock outcrop – is adjacent to the resort swimming pool, and luxury camping does not get any better than this. Peak season may be a bit busy, but for much of the year it will be just you on the fynbos plains, watched over by a billion stars. Keep in mind that this is essentially wild camping (there are no basic facilities such as electricity, and water must be transported from the main lodge). The dramatic location and aquamarine pool more than make up for any ‘hardships’, though. One thing you are sure to sense is the earthy spirituality experienced by hundreds of generations of San who once roamed here. On your feet: Hit the self-guided trails to experience the magic of this wilderness. There are three routes to choose from – four, seven and nine kilometres. The shortest is the most scenic. In the saddle: Mountain bikers can crank a 30-kilometre-plus network of routes within the reserve. Both the 10-kilometre red and 30-kilometre black trails start from reception, initially along a short stretch of Jeep track before you venture on to the quad bike trail. The terrain is sandy in places, but flat enough to suit average riders. Expect to spend two to three hours in the saddle. Behind the wheel: You can explore Kagga Kamma in your own off-road vehicle along a 100-kilometre 4×4 route. Take in the magnificent views as you navigate rivers or rugged ascents and encounter wildlife such as eland, bontebok and lynx. Directions: Make your way to Ceres and then follow the R303 to Op Die Berg for 30 kilometres. About 200 metres past Op Die Berg, turn right at the Cederberg/Ceres Karoo sign and follow the tar road for another 18 kilometres until it turns to gravel; you will reach the Nuwerust turn-off to your right 45 kilometres later. Cost: R200 per site (maximum four). Of the total 42 sites, only five do not have electricity. Wild camping only upon request. The best sites at Nuwerust are in the shade of ancient oaks. This place is very special. The Red Cederberg Karoo Park constitutes 60000 hectares of rucked-up red rock high up in tumultuous amber glory. This is undoubtedly one of the southern Cederberg’s most imposing skylines, and at its heart you’ll find the exquisitely wild Nuwerust Rest Camp. Situated at the foot of Grootrivierhoogte Pass, the old farmstead slumbers within the shadows of the imposing Rooiberg mountain. Fynbos ridges the skyline, while ancient vines, established fruit orchards and spreading oaks daub the valley floor in broad strokes of green. Understand one thing right off the bat though, this is not Dullstroom or the Garden Route. The rasping barks of chacma baboons echo from high up on the craggy peaks and you can bet your khakis there is many a reptile slithering about in the scrubland beyond the camp. Expansive sites, a well-appointed boma (with DStv for the rugby, nogal), good ablutions and mountain views score huge points. The river (with some lekker swimming pools) is but a stroll away, while a large farm dam will help beat the heat on hot summer days. On your feet: The breathtaking 12-kilometre Rooiberg Trail will take you straight up into cloud country, the six-kilometre Waterfall Trail hugs the rugged river course and the two-kilometre Rondekoppie Trail is a gentle stroll. Superb San rock paintings can be seen on the Dassieklippe section once you’ve summited Rooiberg; this is quite a hike, though, and a winner for tough trail runners. In the saddle: Nuwerust plays host to a section of the Ride The Rock MTB race, with two purpose-built single-track loops running through the farm. 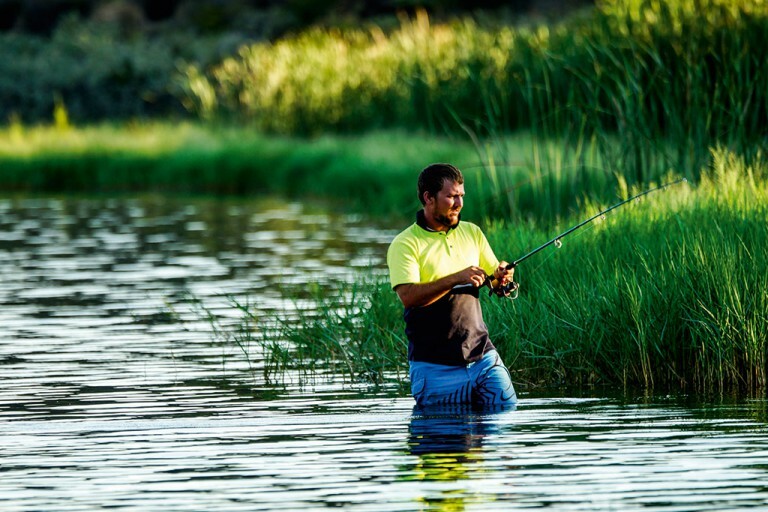 Casting a line: The Breekrans River and its tributaries have perennial pools populated by small-mouth bass as well as Clanwilliam yellowfish, so pack your spinning rods. Directions: Head up the N7 to Clanwilliam and continue for 22 kilometres until you see a sign for Rondeberg on the right. Cost: From R180 per site (maximum six). All 21 sites have electricity. No wild camping. If you only have a Golf or baby Hyundai, don’t despair. The gorgeous Bulshoek Dam shimmers seductively at the foot of the Cederberg, just off the N7 and less than 10 minutes north of Clanwilliam. The dam itself is a good five kilometres long, coiling like a lazy puff adder amid the fynbos slopes, with a number of campsites and small resorts along the water’s edge. Rondeberg is situated towards the bottom end of the dam – fed by the meandering Olifants River – less than a kilometre from the historic dam wall. The set-up here consists of self-catering options, plus a compact camping and caravan site. Be warned, though, that the holidays get busy as the dam is a boating mecca, with great waterskiing, swimming and kayaking opportunities. 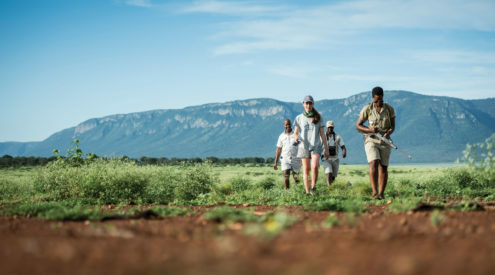 On your feet: The seven-kilometre Rondeberg Nature Reserve Hiking Trail contours around the ridge above the resort. First climb about three-quarters of the summit, then rock-hop all the way around until you can see the dam wall below you again (expect to take around three hours to do the circuit). Behind the wheel: If you’re keen on a scenic day drive, go to Lambert’s Bay for a dose of West Coast culture and delectable crayfish. Otherwise head inland on the Algeria road for wine tasting at Cederberg Wines. On the water: Bulshoek Dam is brilliant for boating and skiing. Paddling or swimming is allowed in designated areas, generally within 20 metres from the shoreline. Casting a line: You can fish just about from your front stoep. The dam brims with large-mouth bass and there’s a solid population of small-mouth bass as well. Other species include kurper, carp and yellowfish, making for great spinning and fly-fishing, too. 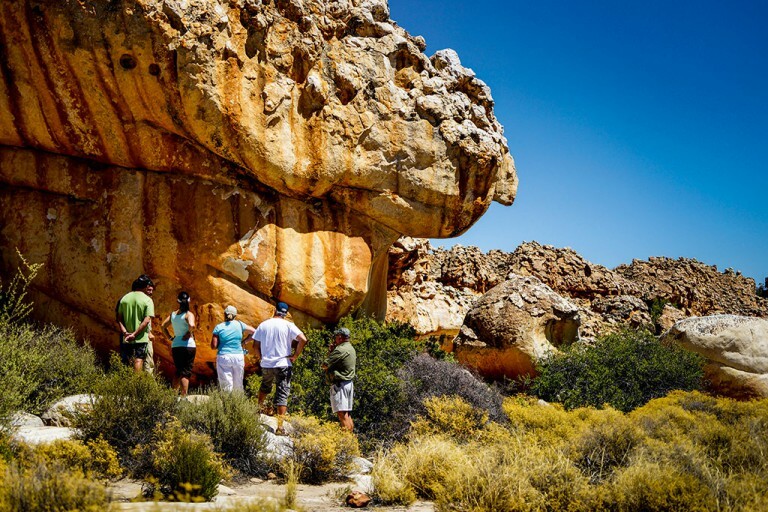 Sanddrif Holiday Resort has the added bonus of sharing a location with the delectable Cederberg Wines and it’s the best place from which to hike to the impressive Wolfberg Cracks. Cost: R180 per site (four people). Houdenbek, a working fruit and vegetable farm in the Koue Bokkeveld, has a stunning private campsite that links onto dedicated single-track mountain bike trails. Cost: R100 per person for first two, R70 per person thereafter. Children under 12 R40. The serene Enjo Nature Farm in the remote Biedouw Valley is the place to go if you want to feel the power of nature. Cost: R70 per person, children under 12 free. Driehoek guest farm, another Cederberg gem, offers alternative trails to the Wolfberg Arch. Cost: R235 for first four people. De Pakhuys needs no introduction if you’re into rock climbing, but their shady waterside camping spot also gives access to many other adventures. Cost: R60 per person, R30 for children under 12. 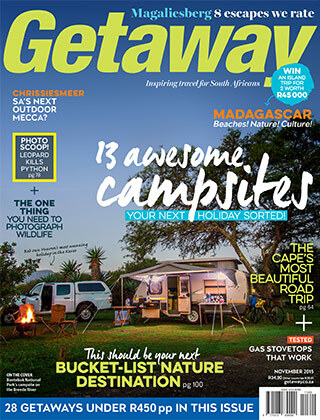 This article first appeared in the November 2015 issue of Getaway magazine. Please note that while all prices were correct at time of publication, they are subject to change at each establishment’s discretion. Please be sure to check with them before booking.